Delhi Police Constable Recruitment 2016 – Apply Online for 4669 Constable Vacancies: Delhi Police Recruitment for Constable posts. Looking for Delhi Police Vacancy 2016? Delhi Police notification announced for Constable (Executive) vacancies. Delhi Police has issued a recruitment notification for the recruitment of Police Constables post. Online applications are invited from male & female candidates for filling up 4669 Executive Constables posts in Delhi. Update: Delhi Police Constable vacancy announced, SSC to conduct this exam. Paper will comprise total 100 questions of only Maths, Reasoning and Gk. Exam will be on 4 March 2017. Age Limit: Candidates age should be between 18 years to 21 years for Male candidates while 18 years to 25 years for Female candidates. Age limitation will be calculated as on 01-07-2016. Age relaxation is applicable as per the rules. Application form: Application forms will be online to apply for. Candidates can apply online for Delhi police constable posts. Physical Endurance Test: Candidates will have to run 1600 Meter. Long jump and High Jump will also be there. How to Apply: All those candidates who wish to apply for Delhi Police Constable Posts, they are required to either apply online from 15th September to 10th October 2016. Date of Online Examination: 04-03-2017. 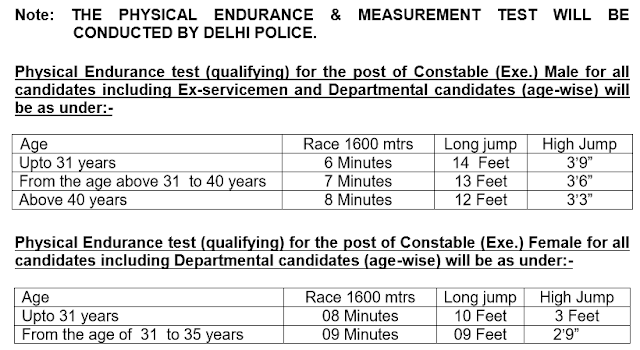 More Details: Candidates are strongly advised to read official Delhi Police Constable recruitment notification for more details about Delhi Police Recruitment for Constable posts regarding age limit, educational qualifications, last date, pay scale, how to apply and online application form.